Are you sitting comfortably? This is one hell of a tale. Cost: £45 for 6 courses, £64 for 10. Wines start at £6 by the glass. About: In the last couple of months Tom Sellers has shot out of nowhere onto foodie headlines. At 26, he has an enviable cheffing cv, having worked at French Laundry and Noma – and I mean worked there properly, not doing a summer stint for free which has now become a rite of passage for any aspiring chef or obsessive foodie. 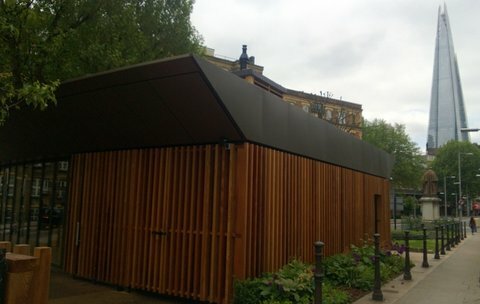 He recently opened on his own, in a corner of Tooley Street that used to be a locked-up loo, now transformed into a bright, slatted wood and glass box with exceptional views of the Shard. It is true that you can’t get a table for dinner at Story without waiting at least a month for the pleasure. But lunch, even for this Saturday, is still a possibility. 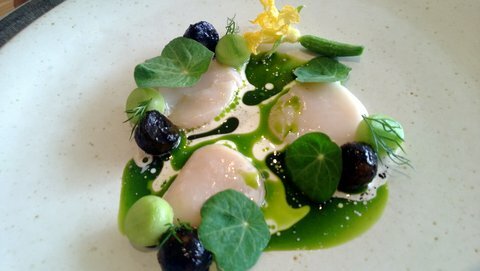 And, as the atmosphere is relaxed and friendly, there is no need to brush up on your foraged foods compendium beforehand – they may take their cooking seriously, but this is no temple to pretension. What we ate: If you have read anything about Story, you will have read about the Bread and Dripping, a small loaf of sourdough in a leather pouch comes alongside a light relish of veal tongue and veal jelly – I could have spooned up a lot more of those delicious, fatty morsels. Next to it is placed a candle. So far, so what. 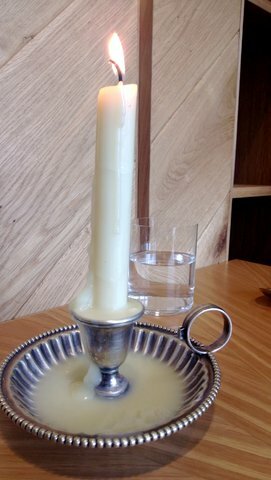 The candle however, is made of beef dripping and, as it melts and collects in its Wee Willie Winky holder, you can dip your bread into the deep, meaty fat. Then, with dizzying speed, came a riot of amuses bouche, or pre-starters. Bite-sized creations of real creativity and a great showcase of what this kitchen can do. 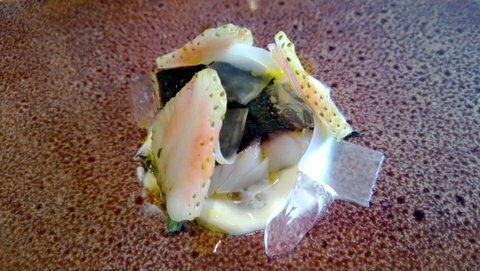 Crunchy Cod’s Skin with Smoked Cod Roe and crispy carrot tops was coated in Powdered Gin Botanicals which tasted like the best taramasalata you could ever have with fleeting moments of juniper and bergamot. The gin flavour had a very good reason to be there and was way beyond a gimmick. Then came Nasturtiums stuffed with Oyster Cream. 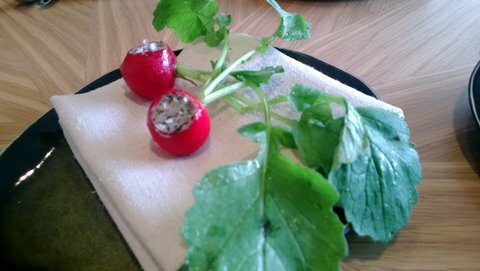 Followed by Radishes with Seaweed Butter – and I finally understood the whole point of buttered radishes. 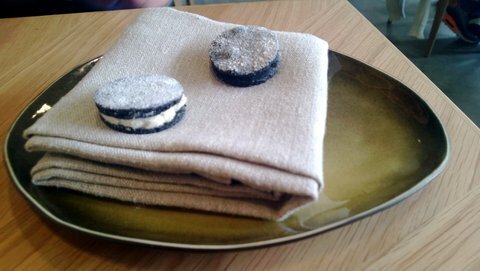 Oreo-look-a-likes were made from Squid Ink and filled with Eel Cream with a light dusting of Powdered Vinegar – first the creaminess of the fish and then you are puckering up like you’ve just popped a sour Haribo. 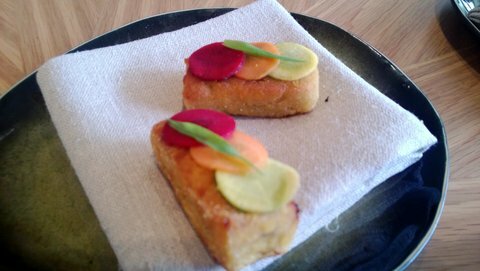 And, finally, a Rabbit Sandwich topped with thinly sliced Carrots pickled in Bergamot and Tarragon. And then it was time for the meal to begin. Taking a break from the eye-popping food arriving at our table, I noticed two food critics, at separate tables. One, a household name, was basking in all the attention he had garnered from other diners and didn’t seem to be paying much attention to the food. Lucky I’m here, I thought, to faithfully retell the adventure. 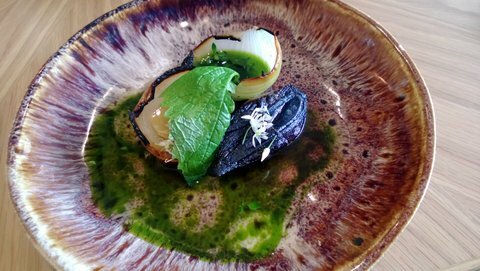 Burnt Onion, Apple, Gin and Thyme was all about the apple consommé flavoured with gin and a bright green thyme oil which carried the charred onion petals to another level. And then, the freshest slivers of raw Scallop dressed in sweet vinegar and anointed with dill oil. The horseradish cream was too subtle for my over-used palate, as was the dill ash, but the cucumber balls provided a cleansing texture contrast. Ready for a smack of Mackerel lightly soused, if you please, in Sloe blossom vinegar with thin slices of green strawberries standing guard and the most intense, tongue-tingling jelly made from unripe strawberries. When served like this, mackerel and strawberries is one of the all-time great food combinations – soon to be decimated at some gastro pub near you. My photographic skills were, once again, put to the test and again, let me down badly. 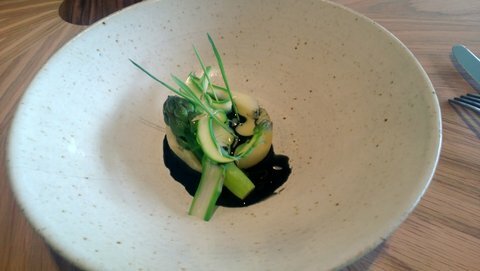 And so to a pat of the best mash served anywhere, dressed with coal oil and asparagus. And then another sensational flavour combo – Beetroot and Raspberry with Horseradish. 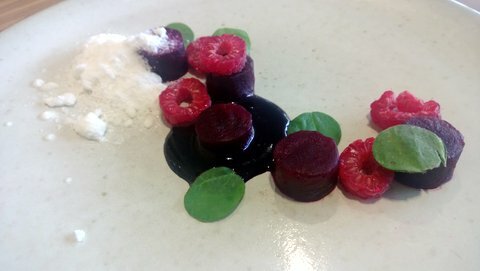 Cylinders of beetroot had been marinated in raspberry vinegar and came dressed with a rich reduction of the juices and horseradish snow. Earthy and zingy, with discs of sorrel and thinly sliced raspberries. Pigeon breast was perfectly cooked and just pink served with a gravy that had been infused with pine needles. The gorse flowers had been plucked on the way into work by one of the chefs. Best of all was the barbecued sea broccoli, which was barbecued and tasted like an intense version of the garden variety. 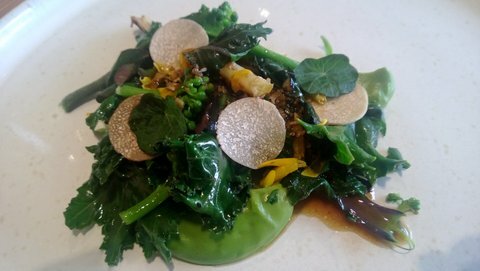 The dish came covered with summer truffles – which are in abundance at restaurants this year and slightly pointless, in my opinion, as they don’t carry the heady aroma of their autumn cousins. Lemon was a paen to the fruit and possibly the hardest thing I have ever had to photograph. 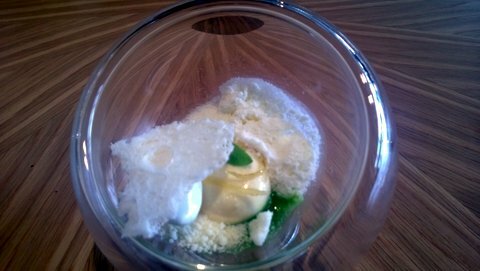 A clear bowl held lemon posing as curd, balm, confit and snow and possibly the best milk ice cream I have ever tasted - not that this photo gives any of it justice. 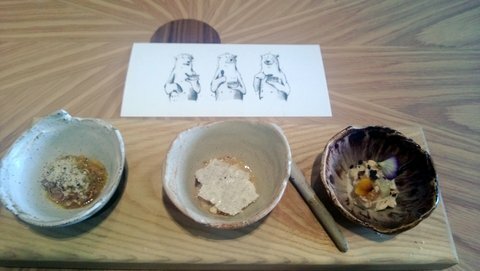 Prune Tea, Lovage and Milk, I will warn you, comes encased in a thick, chewy milk skin – which I loved, but I am a bit odd like that. 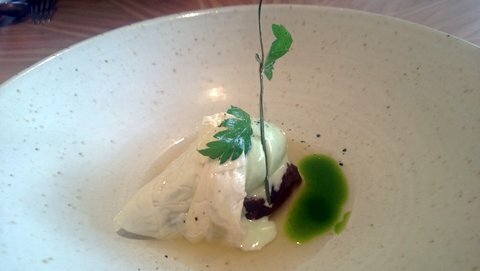 The lovage ice cream is stunning. And so to the denoument. After so many courses of suspense, delight and awe, we were finally coming to the end of this amazing odyssey. Three Bears Porridge involves audience participation and had us rapt, wittering giddily to each other. A picture-book tray carrying three bowls and a sweet but completely un-ergonomic earthenware spoon. Yes, it was our Goldilocks moment. Cheese and shredded hazelnut porridge was perfect for me – salty and nutty. Condensed milk porridge came with burnt sugar and the last was creamy and lemony studded with cardamom. 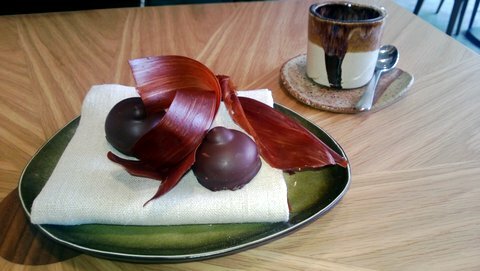 Teacakes with pillow-soft meringue filling and rose and raspberry jelly were served along with pulled chocolate as petits fours. Verdict: Story is a great restaurant. The food is masterful and imaginative and the bright openness of the restaurant means you don’t come out blinking, slightly bilious after hours cloistered in starched napery, away from any natural light. And, £45 is a very reasonable price to pay for this kind of skill and invention. It means that diners can return regularly to get the latest instalment of the Tom Sellers saga. I know I will be.